On this 30th anniversary of the murder of John Lennon, let’s pause and have a Beatles flashback. 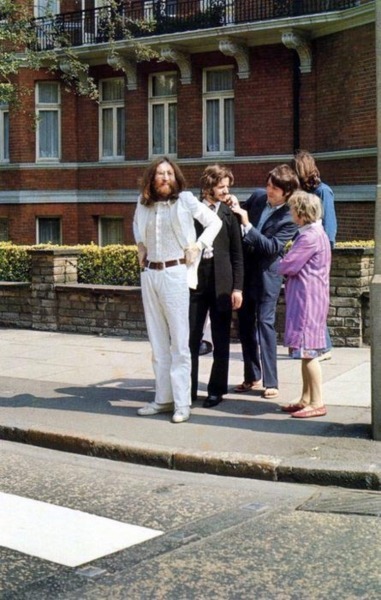 Thanks to Jeff B. for sending along this rarely-seen, but classic photo of John, Ringo, Paul, and George, only moments away from shooting the cover photo for “Abbey Road,” arguably the most famous album cover in rock history. Lennon would have been 70 this year. 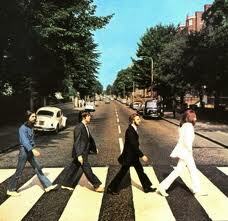 Just last month, the Beatles catalog was officially released on iTunes. On the day that John Lennon was murdered, I was in a garage in Redondo Beach making a stained glass window. Oh how fast 30 years can come and go. RIP my good man…. O.k. 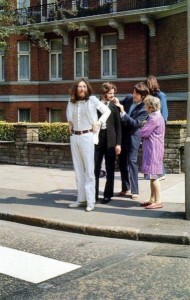 is it just me or does anyone else notice that in the picture before they cross, Paul’s suit appears to be a medium dark blue. In the crosswalk it looks a dark brown?? Maybe it was because Paul was dead? ;-) Or maybe just the way the sun was hitting it?